Travel Jewelry is sponsoring a raffle to benefit TAGS. The raffle will run from October 27, 2012 to November 30, 2012. Raffle ticket sales will begin at the Lure Coursing Event. 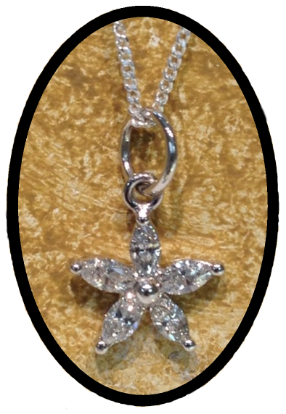 Description: Five-petal diamond flower pendant (total weight .75 ct) set in 18 kt. white gold on a 16" sterling silver chain. Good luck and thank you for supporting TAGS and the Greyhounds in TAGS' care. *Note: Raffle ticket number(s) will be emailed to you. Please make sure you give TAGS a valid email address! This raffle is limited to Texas residents only. The winner will be notified and posted on our website. Payments cannot be accepted through PayPal for the purchase of these raffle tickets. Payments can only be accepted using a credit card or check by mail. To purchase raffle tickets please either call (214-368-8247) or email (tagsintx@gmail.com) TAGS.